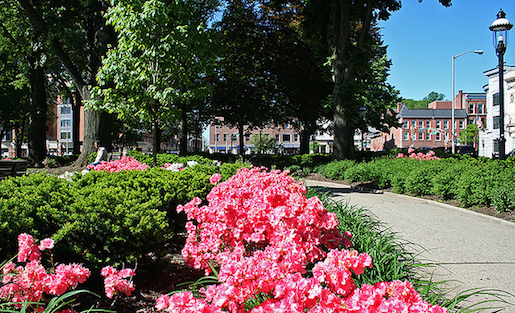 Morristown Green is one of the six incubated sites involved with the Local News Lab. Photo of Morristown Green's "The Green" by The Seeing Eye, Inc. via Flickr CC. In a news landscape of fragmented ad dollars, declining print revenues and segmented audiences, it’s no secret that local journalism is one of the media industry’s toughest nuts to crack. That’s why an initiative called the Local News Lab (LNL) started about a month ago with the hopes of finally getting to the bottom of the community news sub-industry, at least in New Jersey. A $2 million grant from the Knight Foundation allowed the Geraldine R. Dodge Foundation to launch LNL, which is incubating six community sites in New Jersey to test revenue models, undergo collaborative projects and try out community engagement tools. The hope, according to Josh Stearns, director of the journalism and sustainability project for the Dodge Foundation, is that LNL will produce pointers on local news sustainability and how to make community journalism a collaborative effort. 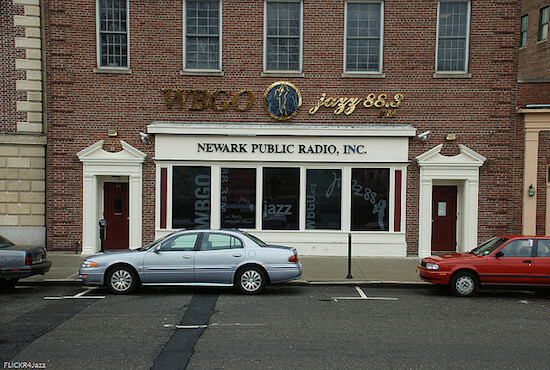 Two of the incubated sites, MorristownGreen.com and Jersey Shore Hurricane News, rely heavily on the idea of collaboration within their communities, whether through churches, local events or organizations such as LNL. Both outlets show that when it comes to community news, you shouldn’t go it alone. Stearns said via email that independent publishers, at least at the local level, must network together in order to make a real, sustainable impact. “What if five regional sites share ad staff and combine their audience numbers to attract new advertisers? What if 15 local newsrooms could support a world-class development and technology shop? What if a data journalist, an event planner or a designer could make a great living by serving a bunch of these local sites?” he asked. A news ecosystem relies on the diverse skills of several experts to keep journalism thriving and allow for more independent reporting to be produced. If there is one lesson hyper-local news operations may want to learn, it would be to look exhaustively for partners in getting the word out. Don’t discount anyone, as strong municipalities consist of healthy local businesses and engaged, active citizens. Kevin Coughlin runs MorristownGreen.com, which he first helped launch with The Star-Ledger and NJ.com before relaunching it on his own in early 2010. Coughlin told me has been successful with his local outlet through an unlikely partner — houses of worship. “St. Peter’s Episcopal Church in Morristown believes in our mission and provided logistical help when I was re-launching the site in 2010. Many houses of worship have been supportive,” Coughlin said in an email. Additionally, Coughlin said it is important that local news editors are giving of their time in the community. Volunteering and participating on community boards is a good way to see and be seen, plus indicate your deep care for the city and school district(s) on which you’re reporting. “I have served on committees for the town’s talent show (a fundraiser for the school district) and the county St. Patrick’s Parade, and for nonprofits such as Cornerstone Family Programs and the county Human Relations Commission,” Coughlin said. Doing this has benefits, he said, such as gaining the support of Morristown Green’s local chamber of commerce (the Morristown Partnership). The Morristown Partnership allowed MorristownGreen.com to be helped financially by the Partnership’s non-profit spinoff, Sustainable Morristown. Putting together an online newspaper involves much more than reporting and writing. Getting steady and diverse revenue streams are of paramount importance, and producing events is another opportunity for collaborating with local venues, politicians, citizens and businesses. But, in order to generate enough interest in the events, community journalism outlets must be consistently putting out quality, accurate news reports. Often, their small staffs can’t keep up with the constant news cycle, but Coughlin has found a way to collaborate with local residents, who possess unique knowledge of their town. “Along the way, members of the community have volunteered as writers, photographers and editors, and I have mentored aspiring young journalists and videographers,” he said. 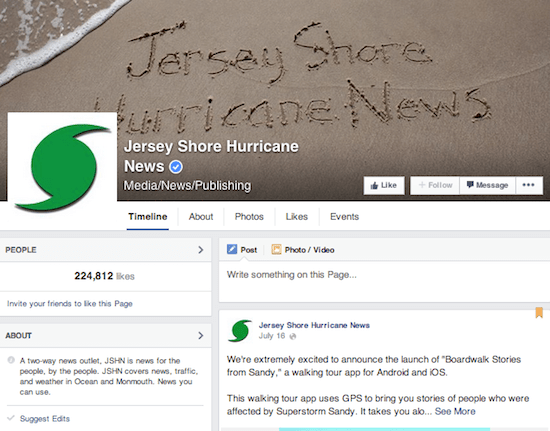 Jersey Shore Hurricane News is a “two way” news organization that operates exclusively on Facebook, though with the eye of a trained editor. Jersey Shore Hurricane News’ editor Justin Auciello said the publication, which covers Monmouth and Ocean counties in the northern part of the Jersey Shore, has always operated with a collaborative mentality. He told me via email, “As a two-way outlet, it relies on reporting from citizen ‘contributors’ — just everyday people who can submit news and information whenever something happens.” Hurricane Irene’s wrath was a huge experiment in citizen journalism and “the perfect moment” for JSHN to launch a Facebook page, Auciello said. JSHN operates solely using the Facebook platform. “It was instantly embraced by the community and served as a disruptive force on the media landscape in the northern Jersey Shore,” he said. Morristown Green and Jersey Shore Hurricane News have taken citizen contribution one step further and sought collaborations with other news outlets, who usually have many of the same goals – deliver good local news and make a little bit of money doing it through advertising, subscriptions, events or sponsorships. According to the Jersey Shore news publisher, there’s a place for competition, but it’s more vital to remember your role as a disseminator of useful information. “One good example is a fire that broke out in his town, Beachwood, just before Independence Day this year. I sent him a message that I had just heard the fire department dispatch over the scanner, and as I was gathering information from sources, radio transmissions, and JSHN contributors, Erik ran out the door with his camera. Within about 10 minutes, he sent me photos, and I published them on JSHN. Then about 30 minutes later, he produced a report on Riverside Signal with additional photos, and I shared his link. It’s more about getting information out rapidly than competing with others,” Auciello said. Additionally, local news editorial leadership can benefit from finding alike company. Hyperlocal publisher group Local Independent Online News is a solid network of community news sites that serves to share solutions, solve problems and reward great work. Still, there wouldn’t be a need for initiatives like Local News Lab if community journalism was a breeze. Coughlin said collaboration within the New Jersey news ecosystem helps, but he hasn’t found a solution to all his problems yet. One idea that intrigues Coughlin is for local news sites to collaborate via an ad network. Public radio or TV stations may be good options for online newspapers wanting to collaborate on content or networked ad sales. Photo by Jazz Guy and used here with Flickr CC license. As for Auciello, he has found a steady revenue source by partnering up with the WHYY public radio and TV station based out of Philadelphia. Auciello produces the Down the Shore blog for WHYY and then publishes those links to Jersey Shore Hurricane News. In the meantime, Auciello said a grant from the New Jersey Recovery Fund is a help to Jersey Shore Hurricane News’s sustainability. Additionally, he said he’s eager to jump into the event hosting realm. The Future for Local News? So what is to come for community journalism? Hopefully, what we learn from Local News Lab and its six participating sites will lead us to some answers -– or at least some smaller lessons we can apply to future local news endeavors. Auciello thinks that as more publishers keep popping up, collaboration will only grow in importance, if not a must for success. “They’ll need to build relationships and be open to collaboration,” he said. Journalists already rely heavily on social media reports to verify and report information, especially during breaking news events, but there aren’t many national outlets that are consistently employing the aid of citizen journalism. Just recently, Twitter and the Online News Association put their heads together for an industry event on social newsgathering called #VerifyNYC. This idea of creating local and national news ecosystems based on collaboration isn’t going away any time soon. To Coughlin, local news will always be around, though the context may change. “The question is, will it exist as a profession, or merely as a hobby?…Anecdotally, most people say they value coverage of local news. Convincing them that such coverage is worth paying for, that is the supreme challenge. Collaboration can help there. We need to put our heads together, crystallize our message, and pitch it loudly and unequivocally,” he said. Correction: A previous version of this article indicated that MorristownGreen.com had an ongoing relationship with The Star Ledger and NJ.com. MorristownGreen.com is now an operation run exclusively by Kevin Coughlin. Angela Washeck is a freelance writer and editor based in Dallas. She is a proud graduate of Texas A&M University, where she earned a Bachelor of Arts in Communication with a journalism minor. Angela also writes for MediaBistro’s 10,000 Words blog and TexasMonthly.com, and she once interned with the TV newsmagazine “Dan Rather Reports.” Her work has been republished on Editor & Publisher, the American Press Institute and more. When Angela is not busy with PBS MediaShift work, you can find her watching “How I Met Your Mother” reruns, watching Aggie football and attending indie/folk concerts in Dallas. Follow her @angelawasheck. It good to see that houses of worship are contributing to the success of local journalism. On top of that, it is great that Jersey Shore Hurricane News incorporates citizen contributors. In many cases larger weather stations stick to the major areas and limit the coverage from a town to town basis. Being from a shore town it is nice to see that they take local perspectives.